Salt Lake County • West side's more diverse schools have less-experienced, lower-paid educators, on average, than east-side schools. 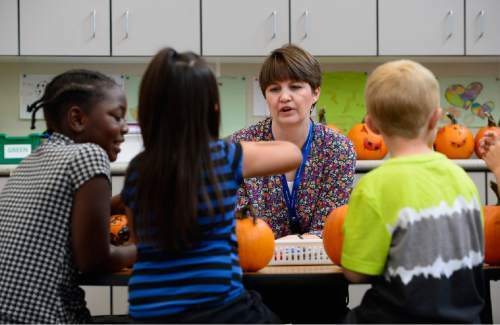 Scott Sommerdorf | The Salt Lake Tribune Plymouth Elementary teacher Tara Fredley works with students who were decorating pumpkins in her 2nd grade class, Thursday, October 1, 2015. Fredley is one of the most experienced teachers at the school. 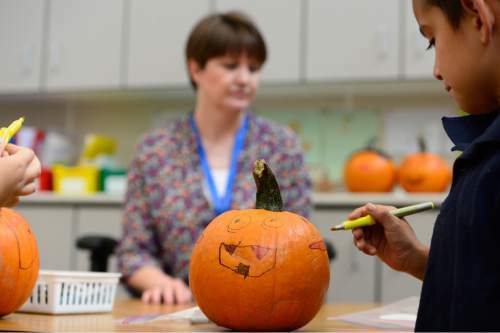 Scott Sommerdorf | The Salt Lake Tribune Plymouth Elementary teacher Tara Fredley checks the work of Boston Richardson, center, and Jonathan Hernandez who were decorating pumpkins with her 2nd grade class, Thursday, October 1, 2015. Fredley is one of the most experienced teachers at the school. 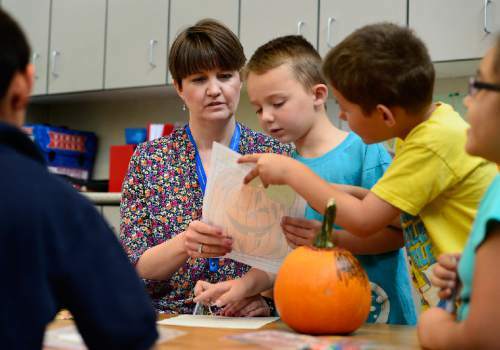 Scott Sommerdorf | The Salt Lake Tribune Plymouth Elementary teacher Tara Fredley works with students who were decorating pumpkins in her 2nd grade class, Thursday, October 1, 2015. Fredley is one of the most experienced teachers at the school. 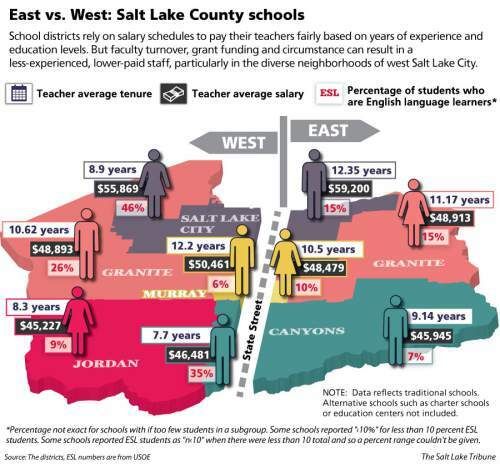 (3 col - DO NOT SHRINK) East vs. West: Salt Lake County schools School districts rely on salary schedules to pay their teachers fairly based on years of experience and education levels. But faculty turnover, grant funding and circumstance can result in a less-experienced, lower-paid staff, particularly in the diverse neighborhoods of west Salt Lake City. Taylorsville • Between lessons on math, reading and social studies, Plymouth Elementary School teacher Tara Fredley took some time to celebrate the start of October last week by decorating pumpkins with her students. One second-grader, pleased with the face she had drawn with markers, lifted her creation above her shoulder and asked Fredley if she could see a resemblance. "You&apos;re more beautiful than your pumpkin," Fredley responded before turning to help another student with a worksheet. Fredley has taught for 25 years, making her one of the more experienced educators at Plymouth Elementary and within the entire Granite School District. She loves to teach, but said she also hit a point of no return after about 20 years in the classroom. "If I weren&apos;t so far into my career I would get out," she said. "I can understand why [teachers] are leaving. It&apos;s a very difficult job." In Salt Lake County, the average teacher has between seven and 13 years of experience, according to a Salt Lake Tribune analysis of personnel data obtained from Salt Lake City, Granite, Murray, Canyons and Jordan school districts. The experience levels tend to be lower at schools west of State Street, where the county&apos;s population is more economically and racially diverse. The trend is most pronounced in Salt Lake City School District, where the average west-side teacher is 3.4 years less experienced, and paid $3,331 less, than the average east-side instructor. Administrators attribute the disparity to several factors. Grants and other special funding help low-income schools decrease class sizes by hiring additional, and younger, staff. And most of the county&apos;s population growth occurs west of State Street, meaning more new schools staffed with comparatively new teachers. But the challenges at low-income schools are also greater, leading to higher rates of faculty turnover on the west side. "It&apos;s still a problem," Salt Lake City school board member Michael Clara said of the experience gap. "It doesn&apos;t matter why it&apos;s happening." In with the new • Most school districts use a uniform salary schedule to pay teachers based on experience and training, independent of what school they work at. The system rewards seniority, with veteran teachers expected to assist and mentor their younger colleagues. "The more years that you&apos;ve taught, traditionally, the stronger teacher you&apos;ll be," said Stephen Dimond, Canyons School District human resources director. Heather Handy graduated from Utah State University in 2008, when school budgets  and education jobs  were slashed in response to the Great Recession. She worked as a substitute teacher and in 2010 was hired at Bonneville Junior High School, on the east side of Granite School District. The average teacher at Bonneville is twice as experienced as Handy. But she said new teachers bring their own strengths to a school, particularly flexibility and a willingness to collaborate. Younger teachers are "more open to new things, new techniques and new strategies," she said. School district data show a wide variety of average experience levels at Salt Lake County schools, from a low of 3.9 years at Salt Lake City&apos;s Backman Elementary to a high of 18.3 years at Magna Elementary in Granite School District. Both of those schools are west of State Street. Murray School District, on the other hand, has more experienced and higher-paid teachers on its west side, bucking the trend of the other districts. But with a total of 10 traditional schools, Murray is the smallest school district in the county, so individual teachers have greater sway on averages. In Canyon School District&apos;s small pocket of west-side schools, teachers are less experienced but receive higher average salaries than Canyons&apos; east-side teachers due to advanced degrees and training. "It&apos;s luck of the draw," said Darren Dean, Murray&apos;s director of personnel. "It&apos;s where the openings are and where people are staying and going." Granite School District spokesman Ben Horsley said experience is important, but effective teachers aren&apos;t defined by their years in a classroom. Recent graduates are trained to use the latest research and learning technologies, he said, and are less likely to push back when administrators try to shake up a struggling school. "When you&apos;re trying to get a train moving out of the station," he said, "you want people who are willing to jump on board." Mo&apos; money, mo&apos; teachers • After nine years teaching in central Salt Lake City, Joan Brown saw a vacancy at Bonneville Elementary and put in for a transfer to the city&apos;s east bench. She got the job, going "from one extreme to the other extreme," she said. And from her 29 years as an educator, she knows many central and west-side teachers would like to make a similar exodus to the foothills. "A lot of them can never get out of those schools," she said. "People in our district have tried for years to get into a school like this." Brown said she wouldn&apos;t have made it this long if she had stayed at her old school. In low-income neighborhoods, where parents often work multiple jobs and struggle to get by, educators don&apos;t have the volunteer and at-home support of east-side schools, Brown said. "I really do think they should be paid more," she said of west-side teachers. "I can&apos;t imagine doing everything they do." Granite School District offers an annual $600 stipend to teachers at its Title 1, or low-income, schools, most of which are west of State Street. Granite&apos;s east-west pay disparity is also the smallest of the five school districts in Salt Lake County. "There needs to be some sort of incentive in addition to a teacher&apos;s overall desire to provide quality education to those in need," Horsley said. Plymouth Elementary was designated as Title 1 last year, and Fredley said most teachers use their stipend on classroom supplies, which would otherwise be purchased out-of-pocket. She said she appreciates the extra cash, and added that low-income families aren&apos;t able to donate classroom items that teachers in affluent areas get for free. "That money is gone in no time," she said. "It&apos;s spent before school even starts." Canyons School District is considering a stipend for its Title 1 teachers. The current proposal would give an extra $1,000 to new teachers, or $2,500 after three years at a school. The proposal is aimed at recruiting and retaining teachers in Title 1 jobs, which Dimond said are traditionally the hardest to fill. The federal government offers student-loan forgiveness to graduates who work in low-income neighborhoods. But Utah students take on less debt than their peers, and many are lured out of state by higher salaries. "They can go anywhere in the country" for loan forgiveness, Dimond said. "Our goal is to get those great teachers to come to Utah and come to Canyons District." Salt Lake City School District does not offer a stipend, but its starting salary is higher than the other school districts in the county. "We invest in our teachers," said Salt Lake City School District Superintendent McKell Withers. "The philosophy is that teachers are obviously closest to the learning of kids and that&apos;s our most important investment." Board member Clara said the district has made changes to its teaching contracts and hiring practices that have helped shrink the east-west experience gap. But the gap persists, and Clara said more needs to be done to support teachers in low-income schools. "Those that work on the west side should be compensated for the work that they do and they should get paid more," he said. "They&apos;re dealing with a population of students that bring a lot of social concerns from home that an east-side teacher doesn&apos;t have to deal with." Stay or go • If educators leave a school, Dean said, it&apos;s more likely that they abandoned the profession than gone chasing after the greener pastures of a more affluent neighborhood. "There&apos;s a pretty high attrition rate," he said, but "we don&apos;t see a lot of teachers that want to transfer schools." With five years&apos; teaching experience, Handy said it&apos;s frustrating to know she could earn the same salary in a career with less work. "Now that I&apos;m a few years down the road, I&apos;m looking at my [non-teacher] peers and what they&apos;re doing," she said. "It&apos;s a hard pill to swallow." With a master&apos;s degree and more than 20 years of experience, Fredley has hit the top of her salary schedule. She could boost her paycheck by completing a doctoral degree, she said, but the investment wouldn&apos;t pay off before she hits retirement. "A thousand dollars a year isn&apos;t worth it for me," she said. Fredley said she thought about transferring schools at several points in her career. But she chose to stay and help her students on the west side. "For a lot of these children, I&apos;m the only stability in their life," Fredley said. "I feel needed here. I feel like I truly make a difference."